This award honours leadership potential in science and technology teaching, research, entrepreneurship or a technology-based business. Nominees must exemplify qualities that are expected to make him/her a future leader in Alberta's science and technology community. This award is sponsored by Alberta Economic Development and Trade which provides a cash prize of $10,000 to the winner. Written nomination submission MUST address the following criteria. Frame your answers for a non-expert in your field; use layman’s terms. 2. Describe some of the activities the nominee has led or participated in that showcase their science and technology talent. 3. How has the nominee demonstrated initiative and involvement in Alberta’s science and technology community? 4. Describe how the nominee demonstrates entrepreneurial qualities such as the nominee’s ability to recognize an opportunity, lead the development of the opportunity and ultimately achieve a significant impact in his/her field. 5. How has the nominee been recognized as a leader by his/her peers? What awards/accolades has the nominee received? 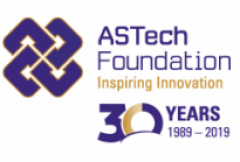 Nominations for the 2019 ASTech Awards are open March 4 – May 31, 2019.